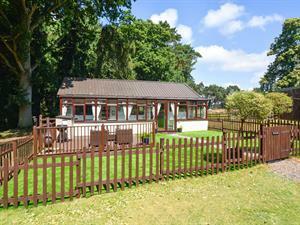 Warren Cottage01263 715779work01603 870304fax Self-cateringSet within a peaceful woodland setting just a stones throw from Aylsham, Warren Cottage offers delightful detached accommodation, all on one level, perfect for a fun family holiday. Guests can enjoy use of the on-site heated swimming pool for two one hour slots on short breaks and four one hour slots for seven night breaks. As if thats not enough, you can also make full use of the Games Room which is just a fifty yard stroll away, and is fully equipped with a pool table, table football, and table tennis. The Games Room has its own private hot tub so you can relax and unwind whilst enjoying the tranquility of the woodland surroundings. The market town of Aylsham has a good range of local shops, a supermarket and a petrol station so you can fill up the car in readiness for lots of days out exploring! The Bure Valley Railway is situated on the outskirts of Aylsham and offers a great day out for adults and children alike. Take a ride on a steam train through open countryside and arrive in Wroxham - gateway to the Broads National Park. If you want to make a full day out of it you can book a dual ticket and take a tour boat trip along the river to Wroxham Broad and Salhouse Broad and back, taking in the stunning scenery and looking out for wildlife as you go. Warren Cottage is ideally placed centrally for all that North Norfolk and the Broads has to offer. Spend your days relaxing and unwinding at one of the beautiful beaches along the coast, Wells next the Sea and Cromer are traditional seaside family towns both having nice sandy beaches that are close to cafes and places to buy an ice cream or two. Driving along the coast between the two towns you will pass through quieter villages, marshland and open countryside. Take a trip to Blakeney Point from Morston for a chance to see Grey and Common Seals basking in their natural habitat, or stop at Norfolk Wildlife Trust at Cley and walk out to the bird hides to see if you can spot a Marsh Harrier who are often seen gliding in the skies of this area. The Broads National Park, a vast expanse of navigable inland waterways, is only a half hour journey away and makes for such a lovely day out. The best way to explore the area is by boat. You can hire a day boat from any of the boat yards in the area- pack a picnic, put on the captains cap and enjoy a tranquil cruise along the rivers and explore a Broad or two. You are bound to see all manor of wildlife including Ducks, Swans and if you are really lucky Kingfishers are often seen flying along the watersedge. Another great way to 'get about' on the water is to canoe. The Canoeman, based in Wroxham, offer guided canoe trails along the river Bure, Wensum and Ant, for a 'closer to nature' experience. What ever you chose to do, Warren Cottage makes for a pleasant place to unwind at the end of the day. • Other: Towels. Travel cot, High chair, Books and games provided. • Notes: Use of tennis courts. Please note children must be supervised at all times close to water. Set within a peaceful woodland setting just a stones throw from Aylsham, Warren Cottage offers delightful detached accommodation, all on one level, perfect for a fun family holiday. Guests can enjoy use of the on-site heated swimming pool for two one hour slots on short breaks and four one hour slots for seven night breaks. As if thats not enough, you can also make full use of the Games Room which is just a fifty yard stroll away, and is fully equipped with a pool table, table football, and table tennis. The Games Room has its own private hot tub so you can relax and unwind whilst enjoying the tranquility of the woodland surroundings.